I love a good shower gel, who doesn’t? Changing your ‘everyday’ products around is a great way to add just that little bit more excitement to your morning routine. I can safely say I have over 15 products in my shower (don’t judge me), and I always look at them all and frown at myself for being such a hoarder, but there’s truly nothing I’d be without! This shower gel has placed itself firmly in my top 5 favourite products of the month, read on to find out why! I was lucky enough to have a friend in Lou, who kindly sent me over a sample of the Faith in Nature Lavender and Geranium Shower Gel (and some super delicious cacao coated mulberries, which sadly didn’t last long enough for the photo!) Lou is a local Wikaniko rep, and in case you haven’t heard of it, it’s a fab online eco supermarket! You can check out Lou’s page here. Lavender can be a bit like the ‘marmite’ of the beauty world, people seem to either love it or loathe it, but as you have probably guessed… I love it! I think it’s something that comes with being an Isle of Wighter. You see, we have our own (award winning) lavender farm on the Island, so since a very young age I have learnt to love the smell! The geranium also really gives it that extra floral hit that makes it a very uplifting fragrance! Anyway, as you didn’t subscribe to the history of the Isle of Wight, or a lecture on Rosie’s favourite smells, I’ll get on and talk about the shower gel shall I? Well, aside from the gorgeous scent this product ticks all the right boxes! I have to say that I love the size of this product.. Weird I know, but I really like having a good supply of products I use every day. These shower gels come in a 400ml bottle, which is just about the perfect size for me. The product foams up really well, and although I haven’t used it in the bath yet, I have no doubt it will produce plenty of bubbles when it needs to! The shower gel has a really great smooth texture, and has worked wonders on my skin. Post shower I am definitely softer, and it keeps my skin hydrated all day! This product is cruelty free and vegan friendly, and with all of the natural benefits, it really does make a great every day shower hero! 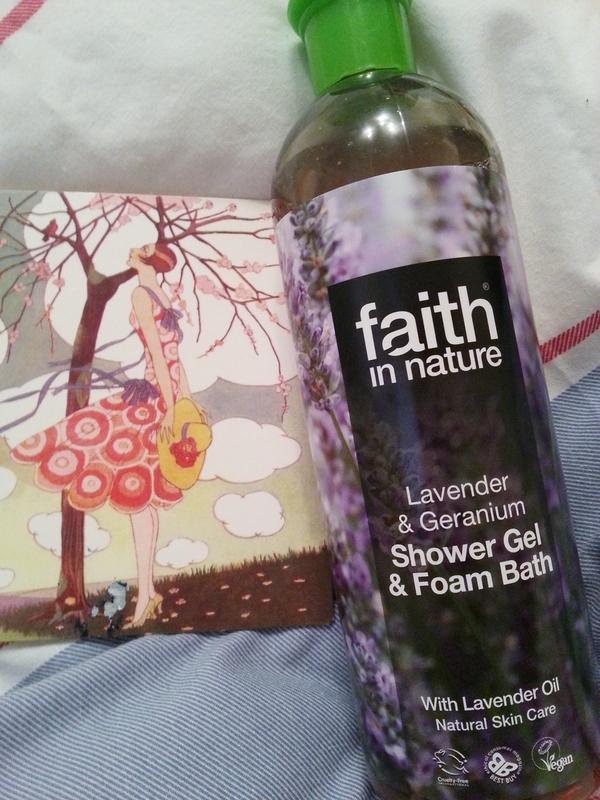 If you’ve used any Faith in Nature products I would love to know about them – please leave a comment below! Haha exactly! Lavender just reminds people of OAPs! Glad you’re loving yours, it’d be great to try another scent when im done with mine! I had no idea there was a lavender farm on the Isle of Wight. Its a shame folks think of it as “old lady” or just as a sleep aid. Though too much of it has the exact opposite effect. I love lavender and geranium. Try a bit of lavender and eucalyptus when you have a cold. Very soothing. The shower gel sounds lovely. Which do you think it smells more of, lavender or geranium? Oh yes! Us Wighters love us some Lavender 🙂 you should come and visit! We also have a garlic farm and an Owl and Monkey Sanctuary haha.. am I selling it? Hmm honestly I’d say the Lavender jumps out most, the geranium just really takes it to the next floral level! Ooh grapefruit!? That sounds AMAZING! Way too tempting…. Haha I know, it makes staying over night anywhere very… heavy! !